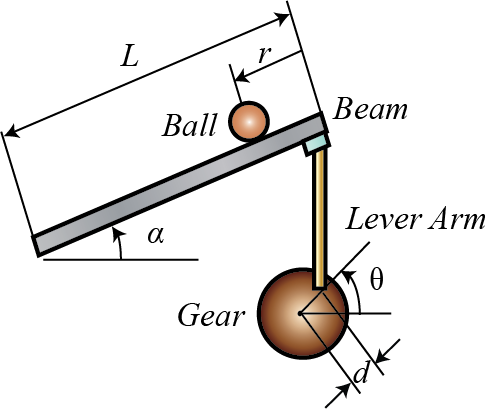 A ball is placed on a beam, see figure below, where it is allowed to roll with 1 degree of freedom along the length of the beam. A lever arm is attached to the beam at one end and a servo gear at the other. As the servo gear turns by an angle , the lever changes the angle of the beam by . When the angle is changed from the horizontal position, gravity causes the ball to roll along the beam. A controller will be designed for this system so that the ball's position can be manipulated. Rearranging we find the transfer function from the gear angle ( ) to the ball position ( ). It should be noted that the above plant transfer function is a double integrator. As such it is marginally stable and will provide a challenging control problem. Note: For this system the gear and lever arm would not be used, instead a motor at the center of the beam will apply torque to the beam, to control the ball's position. The state-space equations can be represented in MATLAB with the following commands (these equations are for the torque control model).